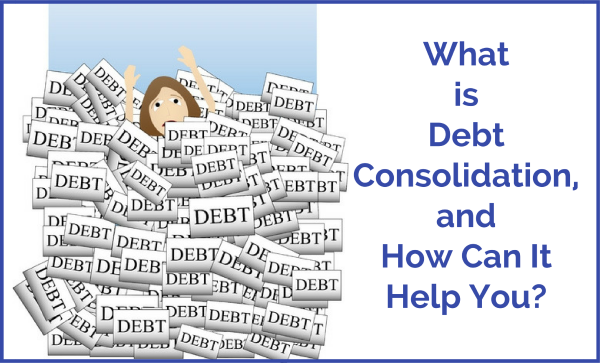 What is Debt Consolidation, and How Can It Help You? When you are in debt, it can be difficult to know how to manage the situation. With so many accounts, and payments, and interest rates, it is easy to become discouraged. One way you can deal with this issue is to consolidate your debts. The process of debt consolidation is one that has been tried over time, and can be very successful. Basically, all of your debts are lumped together. Instead of making multiple payments each month, you make one payment each month. 1. Loan: A debt consolidation loan basically consists of taking one big loan, and then using it to pay off your smaller loans. You take out one loan, with a single interest rate, and pay off all your other debts. Now you only have one loan, and your interest charges are often lower than what you were paying with multiple loans, so more of your payment goes toward paying down the principal. 2. Third party help: With this method, you make arrangements with a trusted third party to help you consolidate your debt. This isn’t a loan. You work out a payment plan with the third party, and make a single payment to that company. The company then disburses payment to your creditors. Everything, from administrative fees to the third party to interest (often reduced) to the principal, is included in this single monthly payment. Debt consolidation puts all of your debts together so that your debt is easier to manage, and you can more easily tackle it. Now that all of your debt is in one place, you can begin to make real progress on paying down your debt. In many cases, more of your payment goes to your principal each month, so you are able to pay off what you owe faster. Your monthly payment is also often a little lower, so it can ease your cash flow problems. Additionally, instead of trying to keep track of multiple debt payments, you only have to worry about one. This simplifies things greatly, and reduces your stress. Another stress reliever is the fact that you can see progress, and a debt consolidation payment plan lets you see an end to the debt. A debt consolidation is only the first step, though. You have to make changes to your spending habits, and look for ways to reduce your expenses and/or earn more money if you want lasting financial success. The biggest pitfall with debt consolidation is that once everything is wrapped up in the consolidation, it feels as though you have “more money” available to you. This is especially true with a debt consolidation loan that often “frees up” your credit cards. A debt consolidation only makes things worse if you immediately use your new freedom to spend back into debt, racking up even more obligations. Remember that debt consolidation works best when you are committed to changing your financial habits so that you don’t get into debt again. Debt consolidation can help you manage your debt, and pay it down. But only you can ensure that you stay out of debt permanently.